Stainless steel drainage systems provide greater longevity for sustainable wastewater solutions. Compare the life-cycle benefits of stainless steel drains, channels, and piping with other types of materials as a durable solution for areas with caustic wastewater. Evaluate transportation cost reductions by choosing sustainable stainless steel drainage systems that weigh only one-third the weight of alternative cast-iron systems. Identify a variety of wastewater applications and the grades of steel that can be selected to improve longevity in high temperature drainage systems. List the unique properties, including high recycled content and recyclability, and simplified labor costs, of stainless steel for use in drainage systems to help meet green building ratings criteria. Sludge, grease, acids, high temperatures—a caustic waste stream is a challenging problem for any drainage system. The control of wastewater in buildings from airports to hospitals and commercial kitchens can lead to costly retrofits. Handling the harsh environment in drainage systems may be one of the last items on the specification list, but critical to the success of many projects. Commercial codes for wastewater drainage require that these systems meet standards for both black and grey water. Industry standards for highly corrosive environments require the control of effluents that can be very hot and/or acidic. Higher concentrations of cleaning fluids, higher temperatures for manufacturing and cleaning are making the task of removing and treating waste a difficult proposition. In the past, engineers have chosen cast iron as the only solution to wastewater problems. Today, some engineers are choosing stainless steel drainage systems, instead of cast iron, because stainless provides higher performance values for meeting the requirements of caustic waste and it provides much greater longevity over the lifetime of a facility. In addition, the advantage of stainless steel is that it is aesthetically pleasing. As more designers are opening up areas to view by the public in restaurants, hospital kitchens, and even manufacturing plants, drainage is becoming a design element. Sleek, stainless steel, ADA-compliant drains, fittings, and fixtures are also evident in multifamily housing, where the rate of investment requires durability. To meet green building targets, engineers are selecting materials that have green properties. Stainless steel is one of these choices as most stainless steel contains approximately 60 percent recycled content. Because it is lightweight in comparison to cast iron, the selection of stainless steel reduces transportation costs and therefore carbon emissions. With all of these considerations, the advantages of stainless steel drainage systems make them the best choice for aesthetics, durability, and sustainability for any project. These systems outperform cast iron or other alternatives in almost every category. The choice of drainage system is often based first on the direct costs of the system. However, calculations show that when you include costs of installation, labor, and product-life expectancy, a stainless steel drainage system is more cost-effective in the end. 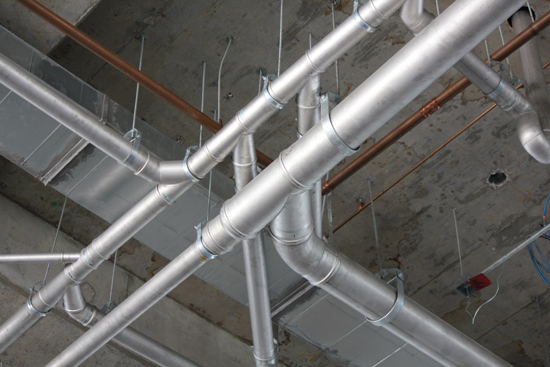 Stainless steel pipes and drainage systems can provide a sustainable, attractive, and durable solution when requiring a plumbing system that can withstand high temperatures.